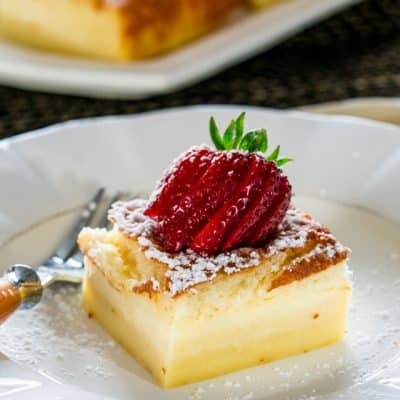 Magic Cake – one simple thin batter, bake it and voila! You end up with a 3 layer cake, magic cake. Preheat oven to 325 F degrees. Grease a 8 inch x 8 inch baking dish or line it with parchment paper so that it's easier to get the cake out. Separate the eggs and beat the egg yolks with the sugar until light and fluffy. Add butter and vanilla extract and continue beating for another minute or two after which you can add the flour and mix it in until fully incorporated. Add the egg whites to a mixer and mix until stiff peaks form. Add the egg whites to the cake batter and gently fold them in. Another variation to folding in the egg whites would be to whisk them in to the cake batter, this is a lot faster and easier. Make sure you don't fold the egg whites in completely, you still want to see some of the white bits floating at the top. * To get the milk lukewarm I usually warm it in the microwave for about a minute.